Last week, I triggered the apt-distupgrade on both my Ubuntu laptops which effectively downloaded Ubuntu 13.04 (“Raring Ringtail”) to these machines. This was actually sort of unexpected as I haven’t been really following Ubuntu’s latest efforts. I’m aware of Canonical’s push to the mobile market: their case to bring Ubuntu to cellphones and other devices received high praise in the media. That is, if Canonical can deliver on speed (UI) and speed (Roadmap). The reason why I bring up Ubuntu Touch is that Canonical is aware of the slugginess of their current Unity interface. I’m pretty certain I brought this up in an earlier post (when I installed/upgraded to 11.10): it’s by default, a memory hog. What keeps me switching back to KDE or say, Gnome 3 is that Unity is heavily supported by Canonical. This is the main reason what keeps me away from other Ubuntu-descendants like Mint. Unity 7 brings a lot of performance improvements, reduced memory consumption and a great number of small UI fixes to bring a better overall shell experience. Unity does feel like it has been improved (besides the fancy new icons for apps and the changes to the launcher): memory wise, I can’t tell the difference. It just generally still feels bloated. Time permitting, I’ll check out Gnome’s state at a later stage. Update 1: Rebooted back in Gnome 3 and my first impression is that Gnome desktop takes a lot less memory than Unity. This entry was posted in Ubuntu and tagged "Raring Ringtail", Ubuntu, Unity on May 12, 2013 by Arthur. Something that reminded me of the issues regarding Unity new ‘touch-based devices desktop paradigm’ that I noticed earlier, which I was going to mention in the previous posting: When you copy (cut/move) a large set of files, Nautilus will show you the ‘Copy File Dialog’ box. If you minimize this box, you will not be able to re-open ever therefore sort of leaving the user in the dark when the copy operation has finished. In Unity, all minimized windows go to the ‘Unity bar’ (no, NOT that kind of bar). Minimized modal dialogs that are part of applications however, do not. You cannot even re-open this box thru the ALT+TAB switch windows method. Sadly, this is a bug reported in earlier versions of Unity and it seems like it is still hanging around on (bug #887821). In Gnome 3, they solved this slightly more elegant: Modal windows are treated the same as general system notifications and you should see it fly by in your message event ‘log’ (so to say). Switching to this dialog, however, can be achieved by using ALT-TAB and selecting the Nautilus icon. Not ideal, but definitely some Gnome developer was paying attention to properly implementing modal dialogs. It would be interesting to see how Microsoft is solving modal dialogs in Windows 8/Metro. Update 10/21/2012: Looks like the modal dialog issues have been fixed in Ubuntu 12.10 in an overhauled Windows switching system that actually looks pretty(see image screenshot). This entry was posted in Ubuntu and tagged modal dialogs, Ubuntu, Unity on October 14, 2012 by Arthur. The previous posting was actually supposed to be detailing the conversion of my DV-5 to Linux, a process that I have done so many times that I can do this with my eyes closed. Sort of. It took a bit longer as I decided to check out OpenSuse and Linux Mint first. Either Linux flavours I disliked from the get-go: OpenSuse is driven by KDE 4, which I really like, except for that it reminds me these days of Lego in both a good and bad way. Mint is where I expect desktop-Gnome 3 to go: only, it behaves very unpredictable. For example, UI elements like menus in NetBeans didn’t work at all. Also, random crashes occurred too many times. So, back to Unity, which, as you probably already knew, I hate. For now, I can tolerate it: however, in my mind, while I appreciate that the Ubuntu-crew is concentrating on a UI that can work with touchbased devices, it would have been so nice if they had provided users with a good UI choice. I am pining for both KDE4 and Mint tho. Or, maybe, just maybe, I really should go back to Debian, which to my surpise is now up to version 6. Same apt, same tools and same architecture. This entry was posted in Ubuntu and tagged DV5, HP, Pavillion, Ubuntu, Unity on October 13, 2012 by Arthur. Back almost 10 years ago, as mentioned probably a-many times, I exclusively used Debian to deploy Postgres database servers. That was mainly, because (officially) there were no Windows versions out yet, well, except for an older 7.2 version. My main interaction therefore was with bash and the postgres commandline tools (psql). I’ve not had a need to install postgres on a Linux machine since a while ago (2007? ), so I was sort of surprised that 9.1 one was the most stable version. I barely touched the 8 series because, as you probably know, back in the days Debian Sarge only supported version 7.4. I was not surprised I was still able to use psql’s commandline tools: heck, I was surprised that I still remember which command options to use to clear buffers and what not. If you do a combined Windows/Linux development, you don’t need pgadmin: as a matter of fact, I barely used it because (and even now), I find the program’s UI underwhelming. The underwhelmingness (is that a word?) of pgadmin, was actually the sole reason to start up a SourceForge project to write a Delphi tool to set things right. I ended up abandoning the idea and focused on a tool to export data forth and back using plain ODBC connections. This initially evolved in a tool called ‘Helios’, written in Delphi, which then became HelioSQL when I rewrote this for .Net. The only reason why I bring this up is to highlight that – while I already had extensive knowledge of Sybase (yay) and SQLserver – my heart was so close to postgres, that I used a similar naming convention for my database query tool. Add. 1: There used to be a joke in the postgres mailing-lists on how to pronounce ‘PostgreSQL’. There were people who thought the unfortunate naming was the main cause of PostgreSQL’s low adoption rate. Everybody I ran into, just called PostgreSQL ‘Postgres’. The same idea is true for ‘HelioSQL’. I wouldn’t dare to claim that ‘Helios’ low adaption rate is because of its silly name. Add. 2: A thing that blew me away was that I could run psql on both Windows and Unix platforms. This is where SQLServer is missing out: as far as I know there are no unix tools available that provide connectivity to SQLserver (well, I’m discounting ODBC for UNIX). This entry was posted in Ordinateurs, Ubuntu on July 15, 2012 by Arthur. Wherein I ran into the third surprise of the week: Gnome 3 is now part of 11.10. Gnome 3: it reminds of Unity, that is: without the bloat. Everything now centers around the “Activities” panel, which is sort of an overview of what is active and what is currently running. There are a bunch of nice tricks you can do but it leaves me still mixed: Since there is no real task bar, it’s really hard/impossible to find particular process messages (like the file copy windows). Gnome 3 seems also geared towards hot-keys and short-cuts: you’ll find Gnome’s Cheatsheet handy (location). There are definitely improvements: Screencasting is now built-in using the hotkey CTRL+ALT+SHIFT+R (output in WebM format! ), effects are used sparingly and geared towards a uniform experience. Do I like Gnome 3? So-so. But, it just has a slightly better feel than Unity. 10/22/2011: I ended up installing the Gnome Shell extensions + an external Dock program (“Dockie”) to take care of the missing features I was looking for. This entry was posted in Ordinateurs, Ubuntu and tagged Gnome 3, Ubuntu, Unity on October 15, 2011 by Arthur. A glorious moment: Today I’m finally retiring my 2004/2005 Centrino laptop: it was initially my work laptop in a previous work life and was eventually passed on to me with the permission of management of said employer. It has served as my main Ubuntu laptop since 2008: as I didn’t have the official permission to carry the laptop’s OS, it made only sense to install Ubuntu on it. I recall, that at that time I had to do some manual stuff to get, for example, the wireless working. Laptop 2 is another pass-me-down, but obviously a lot more powerful than the Centrino/512MB laptop I’m retiring. I expect this to last me for at least a couple of years, with the traditional host of Ubuntu upgrades. Once again, I refuse to run Unity on this thing: however, I might consider running Gnome 3 on this as I believe the Nvidia 8400 should be able to handle this. This entry was posted in Ordinateurs, Ubuntu and tagged Gnome, Nvidia, Ubuntu on September 30, 2011 by Arthur. Just yesterday, Canonical released one of the most important Ubuntu versions of its history: “Natty Narwhal”. The most famous Linux based desktop officially did away with the Gnome shell and replaced it with the Gnome based Unity shell (wikipedia to the rescue). There was a time (see here) that I really wanted to like KDE 4 as opposed to Gnome. I only reverted back to Gnome, because KDE was slower than a pair of mocassins in a pot of molasses. So, yesterday, I started the regular upgrade process: The upgrade to Unity/Narwhal went fairly smooth and when the much touted shell finally showed up properly, I was fairly impressed. While toy-ish, the window handling appears fairly intuitive (“Mac-like”) and the general layout looks, well, clean. However, it’s buggy and it’s slow, with disk-activity and processor activity spiking out of control without any particular reason. Returning back to Kubuntu, (you know, all things KDE), I was pleasantly surprised to find out it that is a lot more stable than I’ve seen almost 1 year ago. Heck, it’s even usable. Kubuntu or Ubuntu? Kubuntu, for now. Maybe in another year, I’ll be looking at Unity as my default desktop environment, but as far as it looks like right now, I won’t be looking at Unity for a while. 05/05/2011: It looks like my laptop (equiped with an Intel 9xx GPU) wasn’t the only one with sudden freezes: it seems to have been fixed, right a couple of days ago. This entry was posted in Ubuntu and tagged Gnome, KDE, Kubuntu, Ubuntu, Unity on April 29, 2011 by Arthur. You asked: KDE or Gnome? I work in both environments: that is, whenever I think there’s a need for working in KDE or Gnome, I just logout and change session (I have both window managers installed). But that wouldn’t really answer the question, I guess. Obviously, I really like KDE 4: it’s generally more streamlined than Gnome and while the new Plasma ‘paradigm’ was not really well received during launch, it has improved a lot. However, it’s still buggy, which is the reason, why I mostly login to Gnome. Gnome, is not without issues either: compared to KDE it’s visually less appealing and (from a user-perspective) less intuitive. At one time, I strictly logged into KDE because of Amarok: KDE’s music player is superior to the bunch of media players that come with Gnome. So, for me the answer to the question ‘Gnome vs. KDE’ would be Gnome. We’ll see how the KDE team fares in the next (K)Ubuntu release. This entry was posted in Ubuntu and tagged Gnome, KDE, Ubuntu on January 30, 2010 by Arthur. 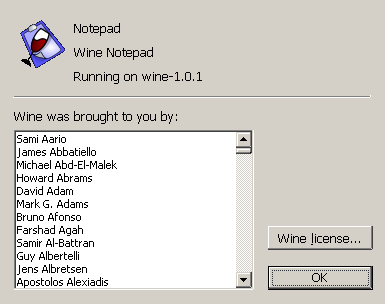 Obviously, a lot of people helped in getting Notepad to run under Wine. This entry was posted in Haiku, Ubuntu and tagged Haiku, Ubuntu on January 30, 2010 by Arthur. There is nothing as glorious as opening up a terminal session on my spare Ubuntu laptop and log right into my server. That is, without downloading either Putty or a host of other MingW/Cygwin utilities on Windows. You guessed it: My main Windows computer is out of working order and until then, I’ll be working on my “Ubuntus b0xen”. No Steam games, no iPod Touch no nothing. Not that I miss iTunes. There’s actually no real excuse for me not using this Ubuntu laptop more often: both Firefox and Chrome work like a charm and appear to be faster. I never really had problems using OpenOffice or VLC (remember this is a 512 MB Centrino laptop) nor did I ever run into heavy multi-tasking issues when programming. I noticed that ever since I upgraded to Ubuntu 9.10, MonoDevelop 2.0 was added as the default package, which is something I have not touched for ages (I run a development version of MonoDevelop). This reminds me that my favourite photoeditor, RawTherapee has officially become open-source, and yes, it runs very well on this machine. I have to admit that it looks weird running it in 1024×768 resolution, but as long as it works and I can get my raw photos to work. This entry was posted in Ubuntu and tagged br0ken, RawTherapee, Ubuntu on January 24, 2010 by Arthur. I run a mix of Gnome and KDE on one of my computers: for a couple of Mono related things, I ended up frequently running the Gnome desktop. Just today, I decided to follow-up on the notifications telling me that I needed to do a dist-upgrade (or rather a partial upgrade), which seemed to suggest that the latest KDE version was finally making it to me. Yay. Everytime I re-open (or rather revisit) KDE I get surprised, and today was not an exception: once again, it looks like the KDE team seems to hammer out excellent releases. I don’t see a point to go through what has changed, this something you can probably find from the release notes, which, today, I don’t feel like pointing out where they are. OK, that was a joke. But seriously, on this lowly laptop, windows zoom by, close up, roll down and all in a sober and subtle manner. There appears to be less disk activity, which suggests that performance has improved since the latest Neon release I was running here a while ago. I find Konqueror still clunky and not so flawless yet (there’s that evil non-Flash player bit), however, the spelling checker finally seems to be working. There are still too many unnecessary messageboxes popping up (the notifications are pretty good and useful) asking me to confirm too many things at times. I definitely (still) can’t stand the “Plasma” desktop windows. For some kind of reason, I can’t stand the way how the “close bar” seem to automatically appear on the right or left side of the window. This entry was posted in Ubuntu and tagged KDE, Kubuntu, Linux, Ubuntu on February 22, 2009 by Arthur. There’s an interesting fade out from initial boot-up screen to Desktop. It’s subtle but extremely effective. The Taskbar is finally looking good, and yes, it does actually auto- hide. Grouped applications are shown actually better than in Windows: KDE shows them stacked with a number of open ‘grouped’ windows. There’s plenty of more settings you can finally set: however, I’m not sure if I like the way how you have to set and move sliders to resize the Taskbar. The ‘Cover flow’ like Screen Switcher works smooth and perfect, even on lower-end graphical system. There’s a whole bunch of notification popping up when some actions finish. I don’t like them all (the less the better), but it’s (generally) visually ‘pleasing’. Then run a normal apt-update followed by an ‘sudo apt-get install kde-nightly’. Remember to log-out and select the KDE-nightly session at the boot screen and you should be good to go. This entry was posted in Ubuntu and tagged KDE, Kubuntu, Linux on December 16, 2008 by Arthur. If you weren’t aware of it, K/Ubuntu 8.10 is about to be released in a couple of days, actually, to be exact, on October 30th. I’ve seen the casual screenshots around of sand-brownish looking desktops and windows-dressing. Those reviews all concentrate on Gnome, of course: As I mentioned earlier, in August, I moved to KDE 4. To say it politically correct, GTK+ is just not my cup of tea. I read that Kubuntu (The KDE-based Ubuntu) 8.10 will (finally) introduce KDE 4 to the masses (KDE 4.1.2 previously on xsamplex) and, as I then mentioned, visually not too much seem to have changed. There are still silly bugs and (generally) if you were happy with KDE 3, you should probably stick with Ubuntu (which by default will still come with KDE 3.2). There was a (long) discussion on the Postgres list about how to properly reply to questions to a mailing-list: the issue is (as many of the contributers already suggest) in the ‘stupid MUAs’ that people are using. If I remember correctly (in the days when I actively took part in the development of an e-mailer), when your MUA encounters the X-Mailing-list headers, a ‘Reply To All’ should use the mailing group’s e-mail address and not the individual listed addressees. I think this was even mentioned in an RFC (I wouldn’t be surprised if that wasn’t RFC 822). Update 1: Oh noes! Debian Vim maintainer switches to Emacs. This entry was posted in Hyperlinks, Ordinateurs, Ubuntu and tagged e-mail, KDE, Kubuntu, Ubuntu on October 23, 2008 by Arthur.